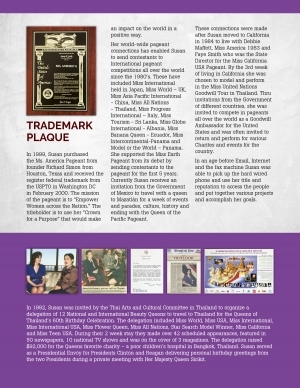 Miss International Beauty® and USA International® is part of the Ms. America Pageant Inc. system which is a California Corporation that currently owns and runs the Ms. America®, Ms. International, Ms. America® International and Miss Pacific U.S. Based in Costa Mesa, California, the Corporation is owned by Susan Jeske who is the CEO. Miss International Beauty® is a registered federal trademark with the USPTO in Washington D.C.
USA International® is a registered federal trademark with the USPTO in Washington D.C.
* Use the “Crown for a Purpose” to support and encourage their involvement in volunteer service. * If invited by the Government of Mazatlan, USA International travels there to compete in the Reina International del Pacifico Pageant. Susan Jeske has been involved in the pageant and entertainment industry for over 36 years and is currently the CEO of the Ms. America Pageant. She has traveled to 26 countries as a goodwill ambassador and Presidential envoy for the United States and has been a spokesperson for Fortune 500 Companies. An advocate for volunteerism she has received many awards and in 2004, she received the “Lifetime Achievement Award” from the President of the United States for the thousands of hours she has donated through the years to all kinds of causes and charities in the United States and world-wide. She has been involved in pageantry since she was 17 years of age as a competitor, judge, pageant producer, director and owner. She has held many local, state, national and international pageant titles and in 1997 at the Luxor Hotel in Las Vegas representing Colorado, Susan bested 50 other contestants and was crowned MS. AMERICA® winning $75,000 in cash and prizes. During her reign, Susan used her “Crown for a Purpose” and created the “Student’s Against Violence" one-hour assembly program where she traveled to high schools across the nation speaking to students about non-violence in schools. For her program she received more than 30 Awards, 15 Keys to the City and Proclamations for her presentation, including a personal letter from the President of the United States. During her reign she was invited by The Knights Templar in the UK and was flown to Scotland where she was “Knighted” by Prince Michael at Sterling Castle for her numerous charity services throughout the world. Susan Jeske has been described as the Matriarch of MS. pageants which includes ALL women single, divorced, widowed or married who want to compete in pageants. In 1999, Susan purchased the Ms. America Pageant from Ms. America Inter-Nationale' Inc. from Houston, Texas which held the pageant once. Ms. Jeske applied for the Trademark in 1999 while making appearances as the first Ms. America. She received the registered Federal Trademark from the USPTO in Washington DC in February 2000. After three years when the Trademark was secured, Susan Jeske revived the pageant and became the founder and CEO of the Ms. America Pageant Corporation. Today the Ms. America Pageant Inc. includes four titles: Ms. America, Ms. America International, Ms. International and Miss Pacific U.S.. The mission of the pageant is to “Empower Women across the Nation and around the World.” The titleholder is to use her “Crown for a Purpose” that would make an impact on the world in a positive way. Susan Jeske directed the first Ms. America International Pageant in 2002 which was held at the Multi-Cultural Festival - June 29, 2002 in Westminster, California. 30 contestants competed for the title and Casey Marie Burns from Long Beach, California was chosen as the winner. Her prize was an all expense paid trip representing the United States at the Miss Earth 2002 Pageant held in Manila, Phillippines, produced by Carousel Productions. From 2002-2006, Ms. America International would travel and compete in international pageant systems Miss Earth, Miss Asia Pacific International and Miss Globe International pageant systems. Susan Jeske's world-wide pageant connections has enabled her to send contestants to International pageant competitions all over the world since the 1980’s. 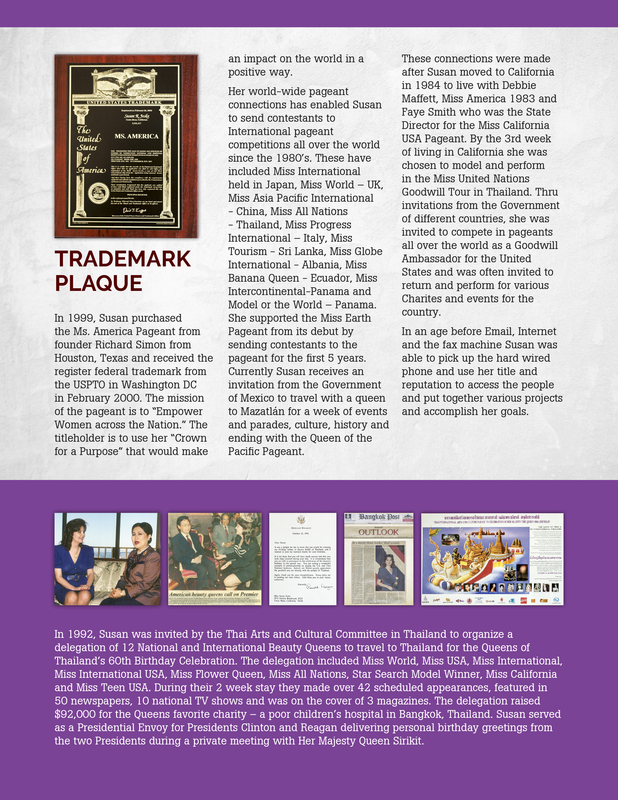 These have included Miss International held in Japan, Miss World – UK, Miss Asia Pacific International - China, Miss All Nations - Thailand, Miss Progress International – Italy, Miss Tourism - Sri Lanka, Miss Globe International - Albania, Miss Banana Queen - Ecuador, Miss Intercontinental-Panama and Model or the World – Panama. She supported the Miss Earth Pageant from its debut by sending contestants to the pageant for the first 5 years. Currently Susan receives an invitation from the Government of Mexico to travel with a queen to Mazatlán for a week of events and parades, culture, history and ending with the Queen of the Pacific Pageant. These connections were made after Susan moved to California in 1984 to live with Debbie Maffett, Miss America 1983 and Faye Smith who was the State Director for the Miss California USA Pageant. By the 3rd week of living in California she was chosen to model and perform in the Miss United Nations Goodwill Tour in Thailand. Thru invitations from the Government of different countries, she was invited to compete in pageants all over the world as a Goodwill Ambassador for the United States and was often invited to return and perform for various Charites and events for the country. In an age before Email, Internet and the fax machine Susan was able to pick up the hard wired phone and use her title and reputation to access the people and put together various projects and accomplish her goals. In 1992, Susan was invited by the Thai Arts and Cultural Committee in Thailand to organize a delegation of 12 National and International Beauty Queens to travel to Thailand for the Queens of Thailand’s 60th Birthday Celebration. The delegation included Miss World, Miss USA, Miss International, Miss International Beauty, Miss Flower Queen, Miss All Nations, Star Search Model Winner, Miss California and Miss Teen USA. During their 2 week stay they made over 42 scheduled appearances, featured in 50 newspapers, 10 national TV shows and was on the cover of 3 magazines. The delegation raised $92,000 for the Queens favorite charity – a poor children’s hospital in Bangkok, Thailand. Susan served as a Presidential Envoy for Presidents Clinton and Reagan delivering personal birthday greetings from the two Presidents during a private meeting with Her Majesty Queen Sirikit. A professional singer, Susan has performed at more than 1500 events before audiences that include 7 United States Presidents, Prime Minister Margaret Thatcher, the Queen of Thailand, Opening of the Ronald Reagan Library, the STS 102 Space Shuttle Discovery Launch of March 2001, President George W. Bush Inauguration, Denver Broncos Televised Super Bowl Victory Party, LA Angels playoffs, several Prime Ministers and Ambassadors all over the world. In 1985, as Miss California American Beauty, she was invited to entertain the troops on a USO Tour to Turkey, Italy, Greece and Spain. The USO troop was flown on C-30 planes to all the military bases and on several aircraft carriers including the ships the Saratoga, SS San Diego and Coronado. 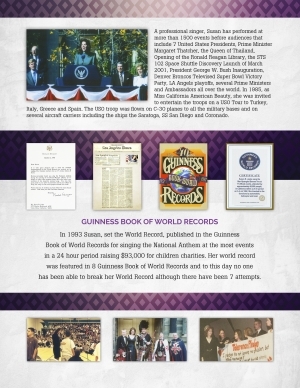 In 1993 Susan, set the World Record, published in the Guinness Book of World Records for singing the National Anthem at the most events in a 24 hour period raising $93,000 for children charities. Her world record was featured in 8 Guinness Book of World Records and to this day no one has been able to break her World Record although there have been 7 attempts. 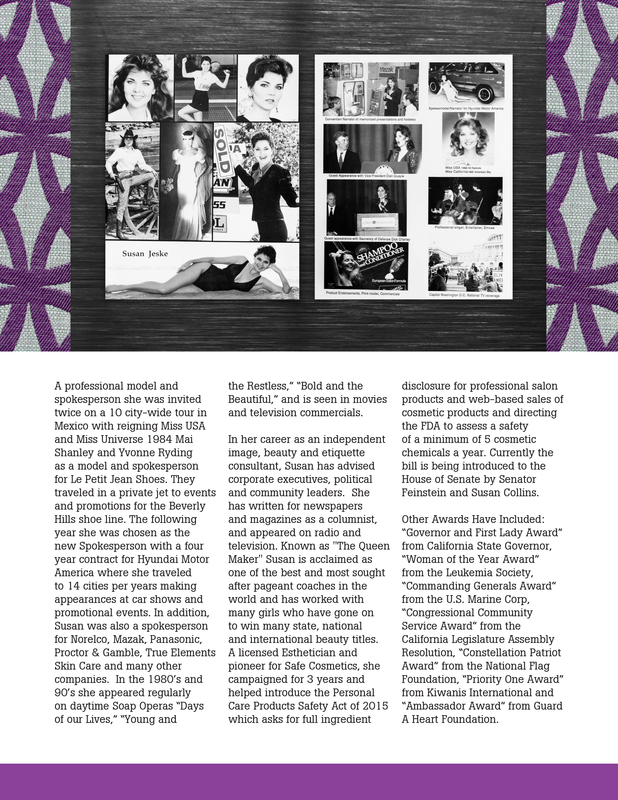 A professional model and spokesperson she was invited twice on a 10 city-wide tour in Mexico with reigning Miss USA and Miss Universe 1984 Mai Shanley and Yvonne Ryding as a model and spokesperson for Le Petit Jean Shoes. They traveled in a private jet to events and promotions for the Beverly Hills shoe line. The following year she was chosen as the new Spokesperson with a four year contract for Hyundai Motor America where she traveled to 14 cities per year making appearances at car shows and promotional events. In addition, Susan was also a spokesperson for Norelco, Mazak, Panasonic, Proctor & Gamble, True Elements Skin Care and many other companies. In the 1980’s and 90’s she appeared regularly on daytime Soap Operas “Days of our Lives,” “Young and the Restless,” “Bold and the Beautiful,” and is seen in movies and television commercials. In her career as an independent image, beauty and etiquette consultant, Susan has advised corporate executives, political and community leaders. She has written for newspapers and magazines as a columnist, and appeared on radio and television. Known as "The Queen Maker" Susan is acclaimed as one of the best and most sought after pageant coaches in the world and has worked with many girls who have gone on to win many state, national and international beauty titles. A licensed Esthetician and pioneer for Safe Cosmetics, she campaigned for 3 years and helped introduce the Personal Care Products Safety Act of 2015 which asks for full ingredient disclosure for professional salon products and web-based sales of cosmetic products and directing the FDA to assess a safety of a minimum of 5 cosmetic chemicals a year. Currently the bill is being introduced to the House of Senate by Senator Feinstein and Susan Collins. Other Awards Have Included: “Governor and First Lady Award” from California State Governor, “Woman of the Year Award” from the Leukemia Society, “Commanding Generals Award” from the U.S. Marine Corp, “Congressional Community Service Award” from the California Legislature Assembly Resolution, “Constellation Patriot Award” from the National Flag Foundation, “Priority One Award” from Kiwanis International and “Ambassador Award” from Guard A Heart Foundation.